The RAF Perton had a short active life then became, with Wrottesley, the headquarters of the Princes Irene Brigade, a crack Netherlands army unit. The brigade left in May 1947 and was followed at Perton by the Polish Resettlement Corps and European displaced persons. The runways were still in use and many people from Wolverhampton learnt to drive there. 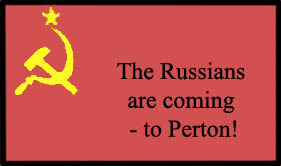 The cold war was at its height and the fears of the many nationalities living on or near Perton were of the Russians. They felt they had suffered enough under the Nazi yoke. Scares were frequent and, in 1951, the government ordered all eastern European aliens on the register - no missing asylum seekers in those days - to report at the nearest police station which, in the case of Perton, was Tettenhall. Anyone with poor documentation was referred to Willenhall Police Station for expert interrogation. During this time, two White Russian aliens reported that a twin engined plane had landed at Perton. No one believed the story; it was considered far fetched. The story was widely circulated amongst the eastern European community here. During September 1951 I was on duty, on cycle patrol, along Perton Lane, and entered the main entrance by the Stone Cottages. It was about 11.30 p.m. a clear night. To my utter amazement I saw a twin engined plane come from the direction of Compton and land. I clearly saw a man with a suitcase get into the plane, which was taxing slowly. I rode towards the plane and made a note of the number. The plane took off. I went to the police pillar in Wergs Road, at the junction with Keepers Lane, and reported what I had seen. On my arrival at Tettenhall Station at 1.45 a.m. to complete duty (6 p.m. – 2 a.m.) I was required by the Sergeant, who had been awakened by the Divisional Superintendent, to enter full details in the Occurrence Book. This I did and went home to Tettenhall Wood. At 9 a.m. I was asleep when my wife awakened me and told me I was to report to Tettenhall Police Station immediately. I did so. I was interviewed by the Detective Chief Superintendent CID and Special Branch officers. The registration number I had taken was a Russian civilian marking and, of course, confirmed the original reports by the White Russians. The sequel? There wasn't one. No press release was authorised and dire warnings were given to all Tettenhall Police Station staff about the provisions of the Official Secrets Act. Despite weary months of observations nothing further was seen. The matter was placed in the hands of the Special Branch in London. An interesting slice of a Dixon of Dock Green type police constable in the 1950s.